(Seychelles News Agency) - A project in Seychelles aims to inspire careers in science, technology, engineering and mathematics (STEM). The STEM Extra is an eight-month after-school programme to empower the youth towards pursuing STEM career opportunities by offering an interactive and inspirational programme held after school hours. The project, expected to start in January, is one of six local projects which has this year received grants from the United States Ambassador’s Special Self Help Programme. Implemented by not for profits organisations, these projects are targeting different groups in the communities including the youth, women and people with disabilities. The grantees met with the US Ambassador to the island nation, David Reimer, last week. “It’s a fantastic program with a lot of positive impact for a country like Seychelles and we hope to be able to do it again next year. We do not have a budget yet but am hopeful we can do it again,” said Reimer. The United States Ambassador’s Special Self Help Programme targets projects which should improve basic economic and social conditions at the grassroots level. Preference is given to proposals for projects that benefit the community rather than proposals that benefit or equip not-for-profit organisations. 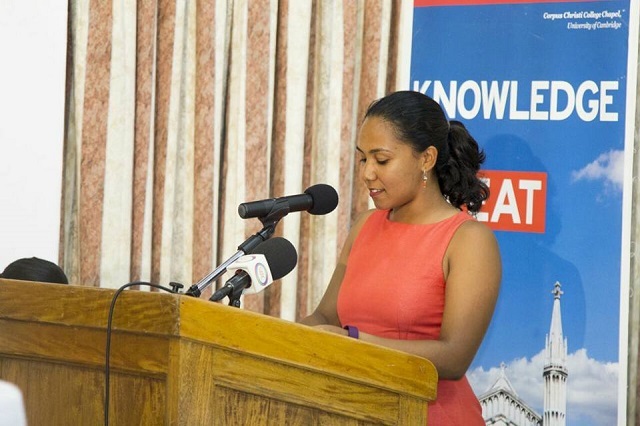 Kalsey Belle from the SIDS Youth AIMS Hub (SYAH) Seychelles said that STEM Extra will target students from secondary schools. “It will tackle Sustainable Development Goals 4 and 8, which ensure inclusive and equitable quality education and promote lifelong learning opportunities for all, whilst goal 8 is promote sustained, inclusive and sustainable economic growth, full and productive employment and decent work for all,” said Belle. Beryl Payet who works in Information Technology explained that through the project SYAH Seychelles will provide mentorship and on-the-job work experience. “The programme will follow the secondary school academic calendar and will begin in January 2019 until August 2019 and will target Secondary 3 to Secondary 4 students,” added Payet. According to Belle, the students who graduate from the programme will have obtained international recognition for participating in an international mathematics competition. “The cohort would have also improved their STEM knowledge while simultaneously obtaining on-the-job experience and a letter of recommendation, gaining a lifelong mentor, the opportunity to interact and network with like-minded individuals and future employers,” added Belle. The US Ambassador Special Self Help Programme is calling on civil society to come up with more innovative projects targeting and benefiting the different group of people in Seychelles -- a group of 115 islands in the western Indian Ocean.